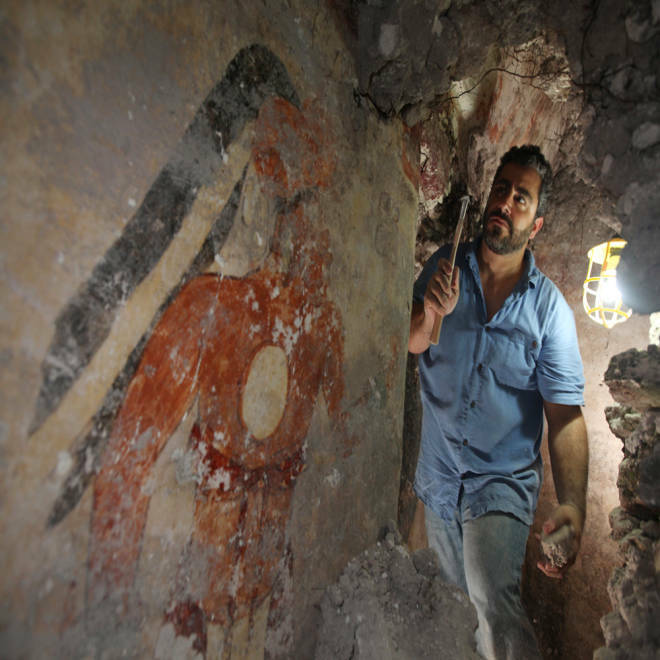 Boston University archaeologist William Saturno carefully uncovers art and writings left by the Maya some 1,200 years ago. The art and other symbols on the walls may have been records kept by a scribe, Saturno theorizes. Saturno's excavation and documentation of the house were supported by the National Geographic Society. Archaeologists have found a stunning array of 1,200-year-old Maya paintings in a room that appears to have been a workshop for calendar scribes and priests, with numerical markings on the wall that denote intervals of time well beyond the controversial cycle that runs out this December. For years, prophets of doom have been saying that we're in for an apocalypse on Dec. 21, 2012, because that marks the end of the Maya "Long Count" calendar, which was based on a cycle of 13 intervals known as "baktuns," each lasting 144,000 days. But the researchers behind the latest find, detailed in the journal Science and an upcoming issue of National Geographic, say the writing on the wall runs counter to that bogus belief. "It's very clear that the 2012 date, this end of 13 baktuns, while important, was turning the page," David Stuart, an expert on Maya hieroglyphs at the University of Texas at Austin, told reporters today. "Baktun 14 was going to be coming, and Baktun 15 and Baktun 16. ... The Maya calendar is going to keep going, and keep going for billions, trillions, octillions of years into the future." 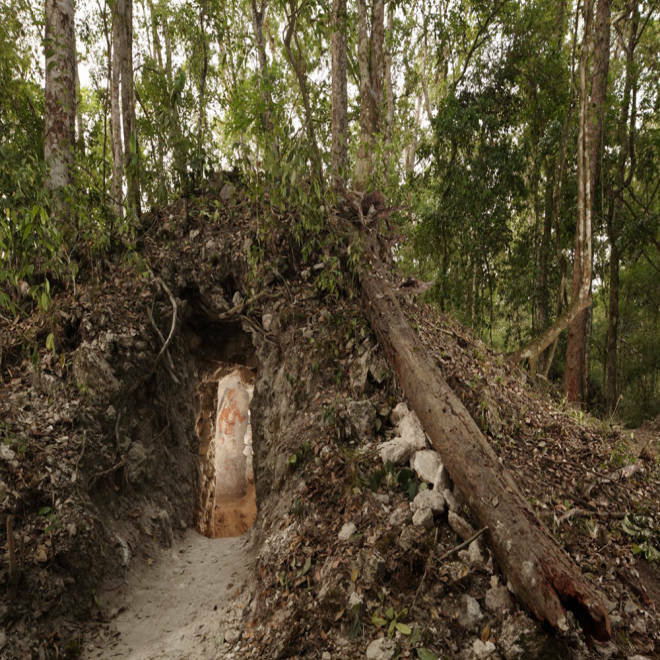 The current focus of the research project, led by Boston University's William Saturno, is a 6-by-6-foot room situated beneath a mound at the Xultun archaeological site in Guatemala's Peten region. Maxwell Chamberlain, a BU student participating in the excavations there, happened to notice a poorly preserved wall protruding from a trench that was previously dug by looters, with the hints of a painting on the plaster. Saturno said he didn't think there'd be much to the wall, but "I felt we had a responsibility to find out at the very least how large this room was." When archaeologists worked their way into the mound, they were amazed to find that it was a richly decorated room from the Classic Maya period, dating back to roughly the year 800. One niche was adorned with the faded picture of a Maya king, wearing a blue-feathered headdress and holding a white scepter. The picture of a scribe holding a stylus, perhaps the son or brother of the king, was painted nearby with the label "Younger Brother Obsidian." Another wall showed a row of three stylized black figures, with one bearing the hieroglyphic name "Older Brother Obsidian." 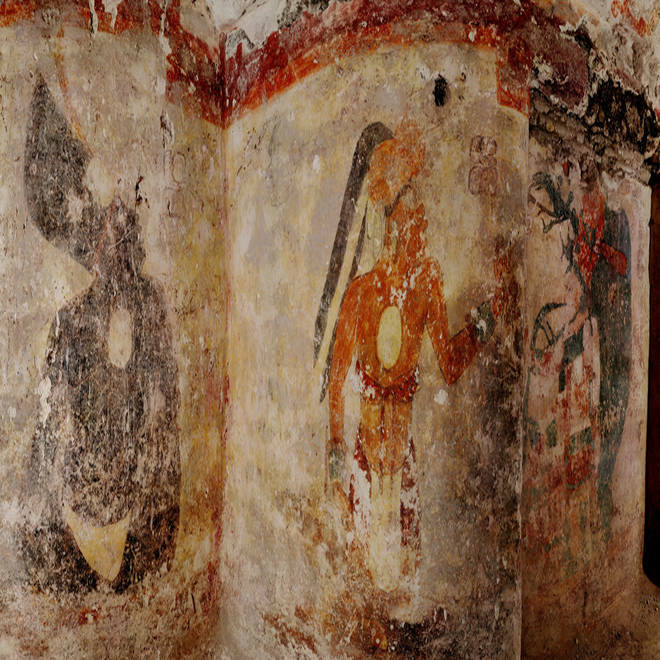 The painted figure of a man — possibly a scribe who once lived in the house built by the ancient Maya — is illuminated through a doorway to the dwelling, in northeastern Guatemala. The structure represents the first Maya house found to contain artwork on its walls. The research is supported by the National Geographic Society. 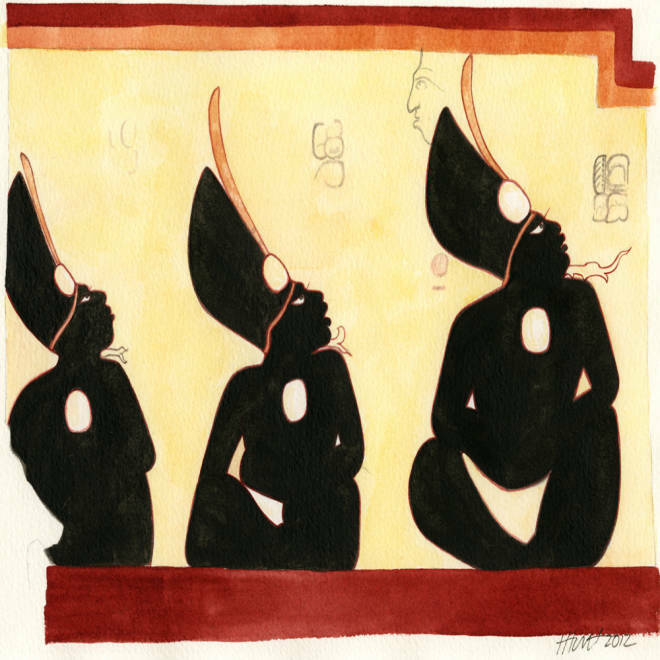 Never-before-seen artwork — the first to be found on walls of a Maya house — adorn the dwelling in the ruined city of Xultún. The figure at left is one of three men on the house's west wall who are painted in black and wear identical costumes. One of the black figures is named "Older Brother Obsidian." The figure in the center appears to be a scribe, labeled "Younger Brother Obsidian." A Maya king is portrayed at far right. Heather Hurst rendered the paintings in clearer detail below. A vibrant orange figure, kneeling in front of the king on the ruined house's north wall, is labeled "Younger Brother Obsidian," a curious title seldom seen in Maya text. The man is holding a writing instrument, which may indicate he was a scribe. 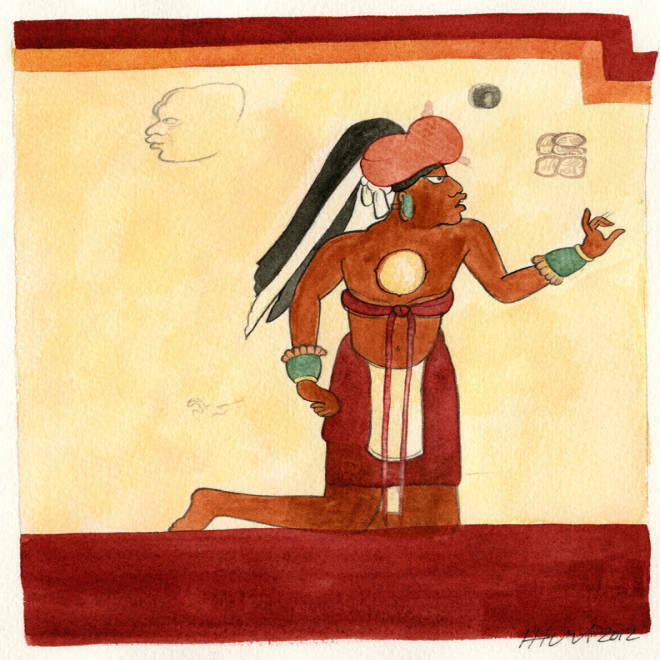 The painting re-creates the design and colors of the figure in the original Maya mural. Three male figures, seated and painted in black, appear in a painting that re-creates the design and colors of a Mural found on the ruined house's west wall. The men wear only white loincloths and medallions around their necks, plus a headdress bearing another medallion and a single feather. One of the figures is particularly burly and is labeled "Older Brother Obsidian." Another is labeled as a youth. A Maya king, seated and wearing an elaborate headdress of blue feathers, adorns the north wall of the ruined house discovered at the Maya site of Xultun. An attendant, at right, leans out from behind the king's headdress. 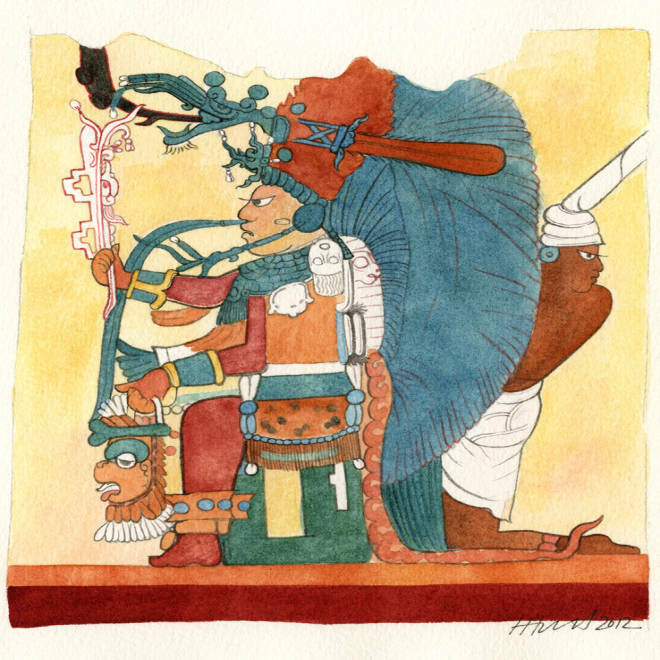 The painting by artist Heather Hurst re-creates the design and colors of the original Maya artwork at the site. Rows of numbers and hieroglyphs were painted on yet another wall. In fact, it appeared that the wall had been plastered over repeatedly and covered with new sets of figures. "What these are giving us are time spans," Stuart said. "Not so much dates, but Maya notations of elapsed time." Stuart said some sets of numbers denoted lunar cycles of 177 or 178 days, along with the sign for a patron god that was associated with each cycle. "This was, we think, a calculator for a Maya priest, an astronomer, to figure out lunar ages," he said. 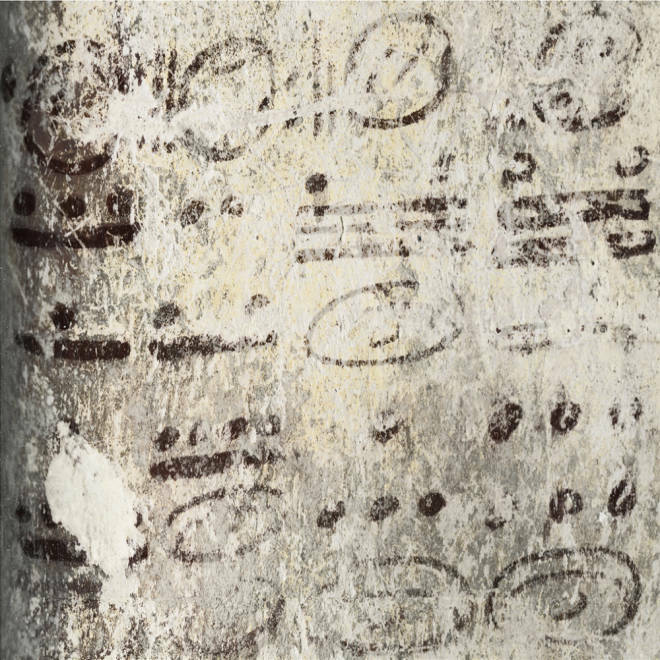 In a news release, Saturno said this represents the first look at "what may be actual records kept by a scribe, whose job was to be official record keeper of a Maya community." "It's like an episode of TV's 'Big Bang Theory,' a geek math problem and they're painting it on the wall," Saturno said. "They seem to be using it like a blackboard." In addition to lunar cycles, the calculations on the wall could relate to the periods of Venus, Mercury and Mars, the researchers reported. Stuart said such calculations could have come into play for predicting eclipses. He imagined that there might be "one or more, maybe two or three of these astronomers or calendar priests working, sitting there on a workbench and writing these notations on the wall." One array of numbers would be particularly intriguing to doomsday debunkers: lists that appear to denote wide ranges of accumulated time, including a 17-baktun period. "There was a lot more to the Maya calendar than just 13 baktuns," Stuart observed. Seventeen baktuns would stand for about 6,700 years, which is much longer than the 13-baktun cycle of 5,125 years. However, Stuart cautioned that the time notation shouldn't be read as specifying a date that's farther in the future than Dec. 21. "It may just be that this is a mathematical number that they find interesting, kind of floating in time," he told me. "But it certainly is expressing a capacity of time. If they were calculating something from their time period, around 800 A.D., yeah, this would have gone way beyond 2012. But again, we're not sure exactly what the base of the calculation is." Four long numbers on the north wall of the ruined house relate to the Maya calendar and computations about the moon, sun and possibly Venus and Mars; the dates may stretch some 7,000 years into the future. These are the first calculations Maya archaeologists have found that seem to tabulate all of these cycles in this way. Although they all involve common multiples of key calendrical and astronomical cycles, the exact significance of these spans of time is not known. Saturno said archaeologists have been trying to get out the word that the end of the Maya culture's 13-baktun "Long Count" calendar didn't signify the end of the world, but merely a turnover to the next cycle in a potentially infinite series — like going from Dec. 31 to Jan. 1 on a modern calendar, or turning the odometer on a car over from 99999.9 to 00000.0. "If someone is a hard-core believer that the world is going to end in 2012, no painting is going to convince them otherwise," he said. "The only thing that can convince them otherwise is waiting until Dec. 22, 2012 — which fortunately for all of us isn't that far away." Saturno and his colleagues plan to be studying the Xultun site long after that time. He said the workshop was apparently part of a residential compound that had been razed over the ages; the workshop was preserved because it was filled in with material rather than smashed down from above. That could suggest that the room was recognized as a special place even when it was abandoned. Research into the room and its purpose is continuing, Saturno said. In its day, Xultun apparently served as one of the major ceremonial cities for the Classic Maya civilization — and yet it's just barely been explored, in part because the area is so remote. "We have probably 99.9 percent of Xultun left to explore," Saturno said. "We're going to be working on it probably for many decades to come. ... Four or five years in to the research project, we have yet to determine its actual boundaries — so my estimate may be off. We may have 99.99 percent left to excavate." In addition to Saturno and Stuart, authors of the Science paper, "Ancient Maya Astronomical Tables from Xultun, Guatemala," include Anthony Aveni and Franco Rossi. The Xultun excavations between 2008 and 2012 were supported by Boston University and the National Geographic Society.